Expression profiling holds great promise for rapid host genome functional analysis. It is plausible that host expression profiling in an infection could serve as a universal phenotype in virally infected cells. Here, we describe the effect of one of the most critical viral activators, Tat, in HIV-1 infected and Tat expressing cells. We utilized microarray analysis from uninfected, latently HIV-1 infected cells, as well as cells that express Tat, to decipher some of the cellular changes associated with this viral activator. Utilizing uninfected, HIV-1 latently infected cells, and Tat expressing cells, we observed that most of the cellular host genes in Tat expressing cells were down-regulated. The down-regulation in Tat expressing cells is most apparent on cellular receptors that have intrinsic receptor tyrosine kinase (RTK) activity and signal transduction members that mediate RTK function, including Ras-Raf-MEK pathway. Co-activators of transcription, such as p300/CBP and SRC-1, which mediate gene expression related to hormone receptor genes, were also found to be down-regulated. Down-regulation of receptors may allow latent HIV-1 infected cells to either hide from the immune system or avoid extracellular differentiation signals. Some of the genes that were up-regulated included co-receptors for HIV-1 entry, translation machinery, and cell cycle regulatory proteins. We have demonstrated, through a microarray approach, that HIV-1 Tat is able to regulate many cellular genes that are involved in cell signaling, translation and ultimately control the host proliferative and differentiation signals. Whole-genome expression profiling exemplified by the development of DNA microarrays represents a major advance in genome-wide functional analysis [1, 2]. In a single assay, the transcriptional response of each gene to a change in cellular state can be measured, whether it is a viral infection, host cell cycle changes, chemical treatment, or genetic perturbation. Specifically, systematic approaches for identifying the biological functions of cellular genes altered during these changes, such as HIV-1 infection, are needed to ensure rapid progress in defining significant host and viral genome sequences in directed experimentation and applications. Therefore, host cellular states can be inferred from the expression profiles, and the notion that the global transcriptional response constitutes a detailed molecular phenotype, such as class discovery, class prediction, drug target validation, and the classification of tumors by expression profiling has begun to receive considerable attention [3–11]. Since its discovery, much of the mainstream human immunodeficiency virus type 1 (HIV-1) Tat research has focused on its ability to activate the HIV-1 LTR. However, to date, besides the transactivation activity on the HIV-1 promoter, few other effects exerted by HIV-1 Tat on cellular and viral genes has also been observed. The Tat protein has been shown to transcriptionally repress host cellular genes and be involved in the immunosuppression associated with viral infection. For instance, HIV-1 infection is able to down-regulate major histocompatibility complex type I (MHC-I) by various different viral proteins, including Tat which represses the transcription of MHC-I, Vpu which retains nascent MHC-I chains in the endoplasmic reticulum, and Nef which can mediate selective internalization of MHC-I molecules from the plasma membrane. MHC class I gene expression has also been shown to be reduced upon infection with the wild-type LAI virus or a Tat exon one recombinant virus [12, 13]. Tat has been shown to down-regulate mannose receptor, EDF-1, CD3-gamma, and TCR/CD3 surface receptor . 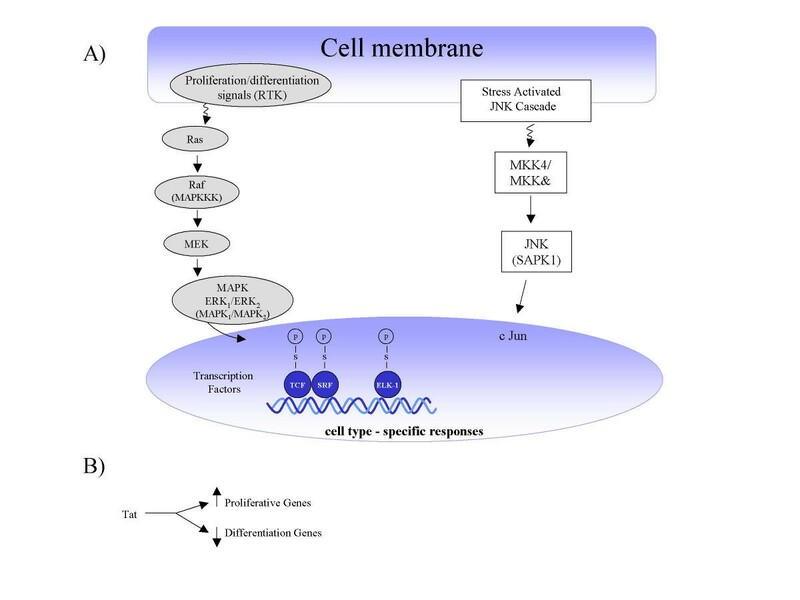 Tat reduces mannose receptor levels and promoter activity in mature macrophages and dendritic cells by interfering with the host transcriptional machinery; resulting in decreased levels of surface mannose receptor needed for Ag (mannosylated albumin uptake) or pathogen capture (Pneumocystis carinii phagocytosis), and eventual delivery to MHC class II-containing intracellular compartments . EDF-1, a gene down-regulated when endothelial cells are induced to differentiate in vitro, was shown to be down-regulated by Tat at the transcriptional level, resulting in the inhibition of endothelial cell growth and in the transition from a nonpolar cobblestone phenotype to a polar fibroblast-like phenotype . When examining the in vivo effects of HIV-1 Tat protein in the Xenopus embryo, it was found that upon injection of synthetic Tat mRNA into zygotes, a marked delay in gastrulation occurred. This led to the altered specification of the anterior-posterior axis and partial loss of the anterior embryo structures. Mechanistically, HIV-1 Tat elicited a general suppression of gene expression, including that of Xbra and gsc, two early genes whose expression are required for proper gastrulation . In relation to the cell cycle, Tat has also been shown to bind to p53 and inhibit the transcription of p53 responsive elements, such as the p21/Waf1 gene promoter. Consequently, upon introduction of stress signals (e.g., gamma irradiation), HIV-1-infected cells lose their G1/S checkpoint, enter the S-phase inappropriately, and apoptose [18–20]. Finally, the inhibition of Tat on translational machinery has also been noted. The potential translational inhibitory effects of the TAR RNA region is mediated by the activation of p68 (the interferon-induced 68-kilodalton protein kinase) kinase, which was down-regulated by Tat during productive HIV-1 infection . Although the mechanism of the host cellular down-regulation remains largely unknown, few reports have attempted to decipher the mechanism of the observed inhibition. For instance, the addition of Tat to PC12 cells up-regulated the expression of the inducible cAMP early repressor (ICER), a specific member of the cAMP-responsive element modulator transcription factor family, in a cAMP-dependent manner. In turn, ICER overexpression abrogated the transcriptional activity of the TH promoter, strongly suggesting ICER's involvement in Tat-mediated inhibition of gene expression . Aside from induction of ICER, Tat is capable of forming complex (es) with a component of TFIID, TAFII250  and Tip60  both of which contain histone acetyltransferase (HAT) activity. In these cases, Tat-TAFII250 and Tat-Tip60 do not affect the transcription from the HIV-1 LTR, but interfere with the transcription activity of cellular genes. It is postulated that different targets of HATs by Tat have different consequences. The interaction of Tat with p300/CBP and P/CAF stimulates its ability to transactivate LTR-dependent transcription, while Tat-TAFII250 or Tat-Tip60 interactions control the transcription of cellular genes. Here to better understand the host response to Tat, we have performed microarray experiments on HIV-1 infected cells expressing the Tat protein. To our surprise many host cellular genes were down-regulated when comparing HIV-1 infected latent cells to uninfected parental cells. Because most, if not all, latent infected cells available to date (e.g., ACH2, U1, J1.1, OM.10) have various expression levels of doubly spliced viral mRNAs, including Tat, Rev, Nef, Vpr, and other accessory proteins, we decided to perform the microarray in a system where Tat was constitutively expressed; asking whether Tat by itself, or in the absence of other accessory proteins, could still down-regulate host cellular genes. Consistent with latently infected cells, we found many cellular genes to be down-regulated in Tat expressing lymphocytes. The down-regulation is most apparent on cellular receptors that have intrinsic receptor tyrosine kinase (RTK) activity and signal transduction members that mediate RTK function; including the Ras-Raf-MEK pathway, and co-activators such as p300/CBP and SRC-1, which mediate gene expression related to hormone receptor genes. Interestingly, we also observed up-regulation of S-phase genes, as well as ribosomal genes involved in translation. Functionally, down-regulation of receptors may allow latent HIV-1 infected cells to either hide from the immune system or avoid extracellular differentiation signals normally regulated by receptors. Up-regulation of S-phase and translation genes may allow speeding of cells through the S-phase and subsequent accumulation at the G2 phase, where most of the cellular and viral translation may take place. Therefore, the presence of Tat may not only control activated transcription on HIV-1 LTR, but also aid in the subsequent translation of viral mRNA in the cytoplasm. Host expression profiling in a sufficiently large and diverse set of profiles could allow additional hypotheses to be drawn regarding the function of genes based on the regulatory characteristics of their own transcripts [9, 11]. Here, we describe the effect of one of the most critical viral activators, Tat, involved in HIV-1 infection and pathogenesis. The rationale for these experiments came from the fact that many AIDS-infected patients who are either at stage III (non-progressors) or under highly active antiretroviral therapy (HAART) treatment show some level of doubly spliced viral messages in their infected cells. One of these messages, Tat, has been well studied and characterized, both from a viral activator standpoint, its effect on few host cellular genes, and its effect as an extracellular cytokine. However, to date there are no reported Tat gene expression analyses that detect more than a few cellular genes. We performed our microarray analysis first with a cDNA blot of 588 genes, which is known to contain various receptors, cytokines, transcription factors, DNA replication genes, and other additional well characterized genes. Figure 1A shows the results of a microarray experiment from uninfected (CEM) and latently HIV-1 infected (ACH2) cells. By definition, latently HIV-1 infected cells contain integrated HIV-1 sequences in the host genome. To our surprise, we detected many cellular genes that were down-regulated in ACH2 cells as compared to CEM uninfected cells. ACH2 cells, similar to many other latent HIV-1 infected cells including U1, OM10.1, 8E5, and J1-1, express multiple doubly spliced messages including Tat, Rev, Nef, and Vpr . Therefore, it would be difficult to determine which one of these viral open reading frames was in fact controlling the observed changes in host gene expression. Gene expression analysis of uninfected and HIV-1 infected cells. A) Both CEM (uninfected) and ACH2 (latently HIV-1 infected) cells were grown to mid-log phase of growth and processed for RNA isolation. Total RNA was labeled with 32P-ATP and hybridized to human cDNA filters (Clontech, 588 genes). Blots were hybridized overnight, washed the next day, and exposed to a PhosphorImager cassette. B) Same as in panel A, except all the 588 genes were plotted as fold change vs. gene index (individual genes). Examples of three genes such as prothymosin-α, C-myc, and p21/Waf1, is shown on the diagram. 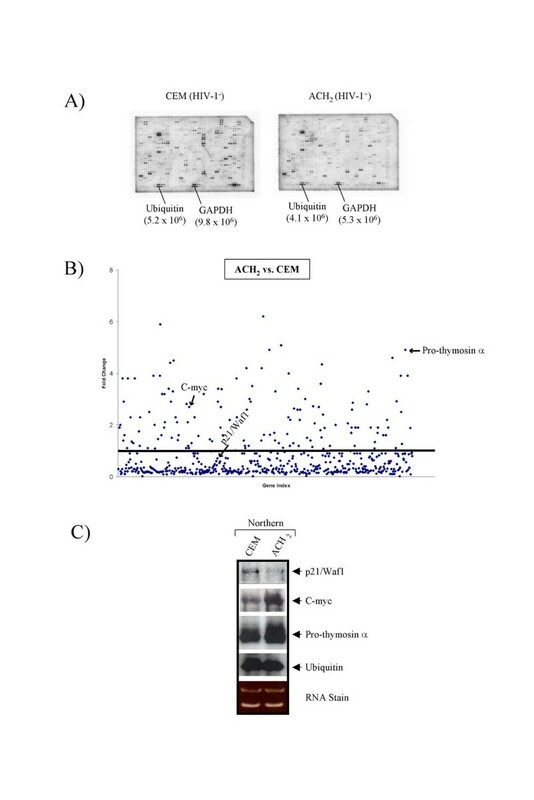 C) Northern blot analysis of prothymosin-α, C-myc, p21/Waf1 and ubiquitin using 10 μg of total RNA, separated on 0.8% formaldehyde gel, and probed with 40 mer anti-sense oligos against respective genes. Bottom of panel C, last insert shows RNA ethidium bromide stain from CEM and ACH2 cells. Nonetheless, when mapping all the 588 genes, we found that 139 genes were activated above 1 fold and 449 genes were expressed below 1 fold (Figure 1B). This is in sharp contrast to latent HTLV-1 infected Tax expressing cells, where more than two-thirds of the same set of genes were activated and scored above one . Some of the genes from HIV-1 latent cells were further processed as control experiments using Northern blot analysis. As can be seen in Figure 1C, and consistent with previously published reports, p21/Waf1 [19–21] was down-regulated and C-myc and pro-thymosin-α were up-regulated in HIV-1 latent cells. Collectively, these experiments point toward host cellular changes in the presence of doubly spliced HIV-1 RNA; however they do not explain whether Tat or other viral genes are responsible for the observed cellular changes. Therefore, we focused our attention on HIV-1 Tat protein, since Tat could readily be detected in immunoprecipitations from 35S labeled latent ACH2, U1, OM10.1, 8E5, and J1-1 cells (20, data not shown). We utilized a well-characterized system of H9 and H9/Tat cell lines for our next set of microarray experiments and increased our repertoire of the known cDNA genes from 588 to 2400. This was accomplished by using glass slides which were printed with cDNAs of 500 bases or higher, and could be used in hybridization with two different sets of RNAs labeled with either Tyramide linked Cy-3 or Cy-5. Results of such an experiment is shown in Figure 2, where H9 cytoplasmic Poly A+ selected RNA was labeled with Cy-5 and the H9/Tat RNA with Cy-3 prior to hybridization. When all the 2400 genes were plotted, some 695 genes were shown to be up-regulated above one fold and 1705 genes were down-regulated below one fold (right hand graphs). This was consistent with the results obtained from the ACH2 microarray experiment, where more than 2/3 of the cellular genes were down-regulated by one or more of the doubly spliced genes. We then arbitrarily chose a cut-off of three fold change for our next set of analyses. This was mainly because many of our in house microarray experiments with HIV-1, HTLV-1, and HHV-8 infection has shown a reproducible correlation between protein and mRNA levels when gene expression levels were up- or down-regulated by more than three fold (data not shown). A collection of all the genes above and below three fold are shown in Tables 1, 2, and 3. Based on existing literature, we categorized all of these genes into known pathways. For instance, genes in Table 1 belong to receptors, co-receptors, and co-activators, genes in Table 2 are all the translation related factors, and those in Table 3 indicate genes that are involved in cytoskeleton, signal transduction, cell cycle, DNA repair, transcription, and chromatin remodeling processes. All genes have a number ratio of Cy3 to Cy5 (C3/C5) indicating a ratio of mRNA from H9/Tat over H9 cells. A brief name description and gene ID accession number is given to the right hand side of each ratio. All genes are divided into up (3 fold and higher) and down (3 fold and lower) regulated in Tat expressing cells. Below is a brief description of genes that we, along with the existing literature, were able to correlate with proliferative and/or differentiation signals. Gene expression analysis from Tat expressing cells. Both H9 and H9/Tat cells were grown to mid-log phase of growth, processed for RNA preparation, and labeled with Tyramide linked Cy-5 (H9) or Cy-3 (H9/TAT). Labeled RNAs were hybridized simultaneously to a glass slide containing 2400 known cDNA genes (NEN Inc.). All genes were plotted similar to Figure 1 and genes above & below 1 fold change were plotted (on the right hand side) to show activation and suppression of all genes. It has long been known that infection by HIV-1 commonly leads to the down-regulation and the disappearance of CD4 receptors from the plasma membrane, a phenomenon referred to as receptor down-modulation. This, in turn, renders cells refractory to subsequent infection by the same or other viruses that use the CD4 receptor for entry; thus creating a state of super-infection immunity. Results in Table 1 indicate that although few receptor genes were up-regulated, most of the cellular receptors in general, were down-regulated in the presence of the Tat protein. Most of these receptors or membranous proteins were initially discovered from immune or neuronal cells, hence they were given names related to the immune or nervous system. For instance, mRNA for the neuropeptide Y-like receptor (Acc# X71635), which was up-regulated in Tat expressing cells, was initially discovered as a G-protein coupled neuropeptide Y receptor, and later found to be homologous to the co-receptor CCR5 needed for HIV-1 infection of monocyte/macrophage cells. Therefore, most of the receptors listed in Table 1 may in fact be expressed in various tissues and have multiple functions. Consistent with our microarray results on CCR5 up-regulation, experiments performed in peripheral blood mononuclear cells (PBMCs) with soluble Tat has shown selective entry and replication of CCR5 virus into cells [27, 28]. Up-regulation of HIV-1 coreceptor by Tat has also been reported, where a synthetic Tat protein that was immobilized on a solid substrate, up-regulated the surface expression of the chemokine receptors in purified populations of primary resting CD4+ T cells. Also, a similar result was seen from Tat protein actively released by HIV-1 infected cells, implying a potentially important role for extracellular Tat in rendering the bystander CD4+ T cells more susceptible to infection . We therefore tested whether H9/Tat cells, which showed an increase in CCR5 expression, could in fact allow better entry and infection of the CCR5 (R5) virus into cells. Figure 3A shows the result of such an experiment, where H9/Tat cells allowed a better replication profile of the R5 than the CXCR4 (X4) virus. The increase in viral titer peaked after some 18 days of infection with the R5 virus, further implying that the CCR5 co-receptor allowed a better selection of R5 virus in Tat expressing cells. Functional and physical confirmation of few genes from Tat expressing cells. A) Infection of mono- and T-tropic viruses into Tat expressing cells. Both HXB-2 and BaL strains of HIV-1 were infected into H9 and H9/TAT cells. Supernatants were collected every 3 days and further processed for p24 gag ELISA assays. 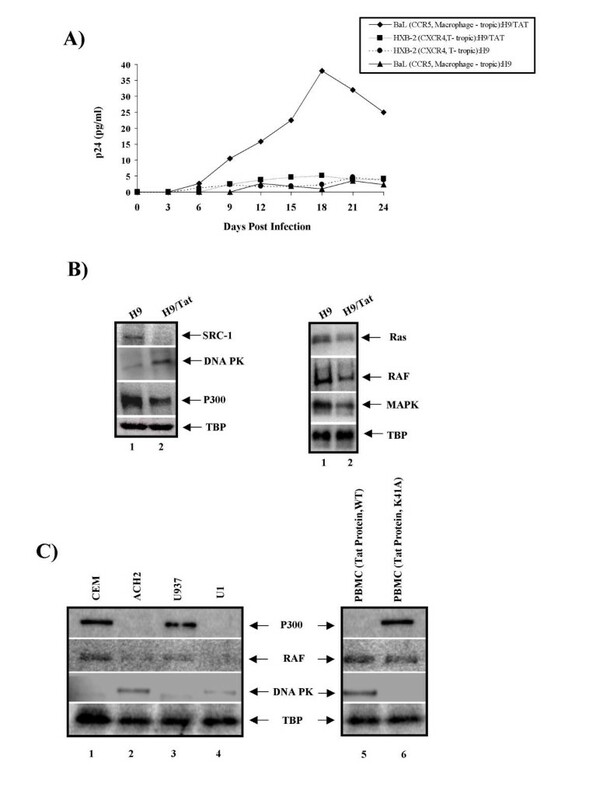 B) Western blot analysis from H9 and H9/TAT expressing cells using co-activators (SRC-1), DNA damage (DNA-PK), activator (p300), and signal transduction (Ras, RAF, and MAPK) antibodies. TBP stands for TATA binding protein, which served as positive control in western blots. C) Western blot analysis from CEM (uninfected T-cell), ACH2 (infected T-cell), U937 (uninfected promonocytic), U1 (infected promonocytic), and PBMCs treated with purified Tat wild type or K41A mutant (100 ng/ml) proteins. Fifty microgram of whole cells lysates were processed for western blots with anti-DNA-PK, p300, RAF, and TBP antibodies. Another example of co-receptors with multiple functions is the leukotriene family member B4, which was down-regulated in Tat expressing cells (Acc# D89078, Table 1). The cysteinyl leukotrienes (CysLT), LTC, LTD, and LTE, were first shown to be essential mediators in asthma . However, when the mouse leukotriene B4 receptor (m-BLTR) gene, was cloned it was shown to have significant sequence homology with chemokine receptors (CCR5 and CXCR4), co-receptors for many different HIV-1 clades . Along the same lines, when cells were infected with 10 primary clinical isolates of HIV-1, leukotriene B4 receptor was primarily utilized for efficient entry into cells which were mainly of the syncytium-inducing phenotype . Therefore, up-regulation of neuropeptide Y-like receptor and down-regulation of leukotriene B4 receptor in Tat expressing cells indicates a selective advantage of one class of virus (CCR5) over another (CXCR4). Other examples of consistency between our microarray results on receptors and the HIV-1 Tat literature, include the down-regulation of gene expression in uPAR (Acc# X74039), IP3 (Acc# D26070, D26351), Glu R flop (Acc# U10302), PPAR (Acc# L07592), alpha-2 macroglobulin receptor protein (Acc# M63959), and receptor tyrosine kinase (Acc# L36645, U66406) genes. The transmembranous urokinase-type plasminogen activator receptor (uPAR; CD87) focuses the formation of active plasmin at the cell surface, thus enhancing directional extracellular proteolysis. Interestingly, the promoter activity of the CD87 gene was shown to decline after infection , implying that post integration of HIV-1 may in fact down-regulate CD87 gene expression. Similarly, inositol 1,4,5-trisphosphate receptors (IP3R) are intracellular calcium release channels involved in diverse signaling pathways and are required for the activation of T lymphocytes . Tat (also implicated as a neurotoxin) has been shown to release calcium from inositol 1,4, 5-trisphosphate (IP3) receptor-regulated stores in neurons and astrocytes causing premature apoptosis . Down-regulation of IP3 may therefore contribute to viral latency and maintenance of an anti-apoptotic state in cells. HIV-1 infection can cause extensive neuronal loss and clinically, a severe dementia. The cause of the neurotoxicity remains unclear as neurons are not infected, but the disturbance of glutamate-linked calcium entry has been implicated. It has been shown that HIV-infected brain has a decrease of mRNA and protein of the GluR-A flop subtype of alpha-amino-3-hydroxy-5-methyl-4-isoxazole propionic acid (AMPA) glutamate receptor in cerebellar Purkinje cells. The observed disturbance of AMPA receptors may contribute to the neurotoxic process in other vulnerable brain regions and clinically to the development of dementia . Interestingly, in a mouse model AMPA receptors in the cortex, striatum, hippocampus, and cerebellum declined by 29–50% as early as 8 weeks post-retroviral inoculation. Thus, the reduction in AMPA receptor density may contribute to the development of the cognitive abnormalities associated with HIV-1 infection . Finally, patients with AIDS who are receiving therapy with HIV-1 protease inhibitors have been reported to be afflicted with a syndrome characterized by lipodystrophy (fat redistribution favoring the accumulation of abdominal and cervical adipose tissue), hyperlipidemia, and insulin resistance. Potential mechanisms for altered adipocyte function include, direct binding to PPARgamma or inhibition of transcription of PPARgamma promoter . The lipodystrophy syndrome may be a result of the inhibition of 2 proteins involved in lipid metabolism that have significant homology to the catalytic site of HIV proteases; namely cytoplasmic retinoic acid binding protein type 1 and low density lipoprotein-receptor-related protein . An additional mechanism of PPAR down-regulation may be related to Tat expression in latent cells. Viruses have evolved a remarkable variety of strategies to modulate the host cell translation apparatus with the aim of optimizing viral mRNA translation and replication. For instance, viruses including Herpes simplex virus type 1 (HSV-1) have been known to induce severe alterations of the host translational apparatus, including the up-regulation of ribosomal proteins and the progressive association of several nonribosomal proteins, such as VP19C, VP26, and the poly(A)-binding protein 1 (PAB1P) to ribosomes . In the case of HIV-1, approximately one infectious HIV-1 genome in an infected cell could be transcribed and translated into 50,000 to 100,000 physical particles . This poses an immense challenge for the virus to be able to transcribe, splice, transport, and translate its RNA into fully packaged virions in a timely fashion. Therefore, it would be advantageous for the virus to set the stage for each successive step necessary for viral progeny formation. One such event is Tat's ability to control genes that aid in translational machinery. As seen in Table 2, many of the critical components of a functional ribosome, including large subunits L 3, 6, 26, 31, 38, and 41, as well as S 6, 12, 20, and 24, and many of the translation initiation factors are up-regulated by Tat. This would imply that Tat up-regulates many ribosomal genes that may be necessary to produce functional ribosomes needed for viral mRNA translation. Therefore, interfering with translation could provide a new strategy for anti-HIV treatment. Along these lines, when the aminogylcosides (kanamycin, hygromycin B, paromycin and neomycin) due to their ability to inhibit protein synthesis by affecting ribosomal fidelity, or puromycin because of its competing ability with tRNAs for binding on the large ribosomal subunit, or cycloheximide which inhibit the large ribosomal subunit by preventing ribosomal movement along the mRNA, were used in active HIV-1 infection, it was found that both cycloheximide and puromycin produced the greatest decrease in HIV-1 inhibition, presumably by inhibiting the large subunit of the ribosome . Translation of HIV-1 RNAs pose a challenge since they all contain a TAR sequence at their 5' end. The Tat-responsive region (TAR) of HIV-1 exhibits a trans-inhibitory effect on translation by activating the interferon-induced 68-kilodalton protein kinase. Productive infection by HIV-1 has been shown to result in a significant decrease in the amount of cellular p68 kinase. The steady-state amount of p68 kinase was found to be reduced in cells stably expressing Tat. Thus, the potential translational inhibitory effects of the TAR RNA region, mediated by activation of p68 kinase, may be down-regulated by Tat during activation of the latent virus . Along these lines, a Tat peptide antagonist, which bound specifically to TAR RNA and competed with Tat for binding, reduced Tat-dependent translation . Finally, upregulation of translation genes in Tat expressing cells is specially intriguing in light of the recent discovery of internal ribosome entry sites (IRESs) in HIV-1 gag ORF . IRESs are thought to promote initiation of translation by directly binding to ribosomes, in a manner independent of the mRNA cap or of scanning through upstream sequences. Since, the TAR is located at the 5' end of all HIV-1 RNA transcripts and the presence of secondary structure at or near the 5' end of RNAs reduces the accessibility of the 5' cap to eIF4F, it is thought that this feature of HIV-1 mRNAs can inhibit their cap-dependent translation [44–46]. Therefore, a possible function of the HIV-1 gag IRES might be to serve as a mechanism to bypass the structural barriers to cap-dependent translation by recruiting ribosomes easily and directly to the gag ORFs. IRES entirely contained within a translated ORF has been shown in the MMLV gag , and host mRNA encoding p110PITSLRE and p58PITSLRE. Along these lines, cap-dependent translation may be cell cycle regulated, especially when cells are arrested at the G2 phase of the cell cycle, where the cap-dependent translation of most cellular host cell mRNAs is inhibited [49–51]. Results in Table 3 indicate that many seemingly different pathways are being regulated by Tat. However, the signal transduction pathway, MAPK, has been shown to control and be upstream of DNA-replication, transcription, and cell cycle pathways [52–54]. The mitogen-activated protein kinase (MAPK) pathway, consisting of the MAP kinase kinases (MKKs) 1 and 2, and extracellular signal-regulated kinases (ERKs) 1 and 2, which have been implicated in diverse cellular processes including proliferation, transformation, and cell differentiation . The MAP kinase (MAPK) pathway has emerged as a crucial route between membrane-bound Ras and the nucleus. This MAPK pathway encompasses a cascade of phosphorylation events involving three key kinases, namely Raf, MEK (MAP kinase kinase) and ERK (MAP kinase). The MAPK pathway controls ERKs 1 and 2, c-Jun N-terminal kinase (JNK), and p38. 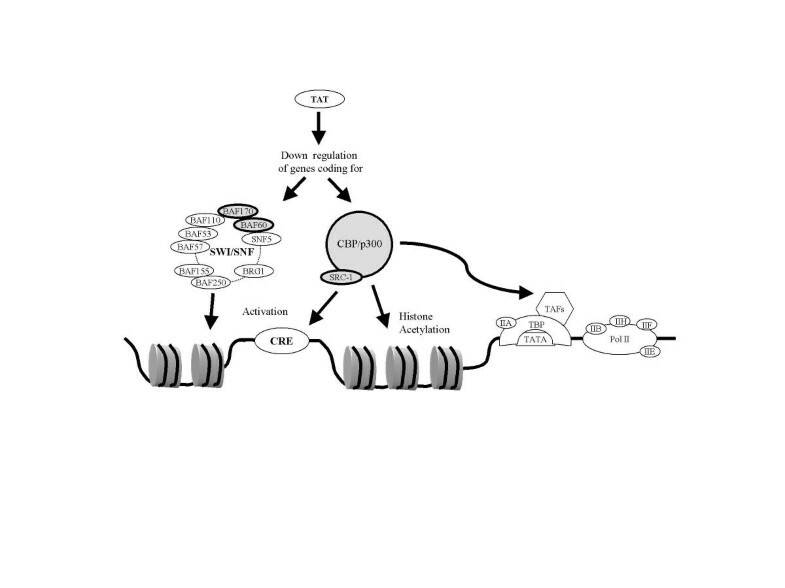 These signaling pathways in turn, activate a variety of transcription factors including NF-kappaB (p50/p65), AP-1 (c-Fos/c-Jun), and CREB phosphorylation, which in turn coordinate the induction of many genes encoding inflammatory mediators. Cytokine receptors such as IL-3, GM-CSF, and the interferons transmit their regulatory signals primarily by the receptor-associated Jak family of tyrosine kinases, and activate STAT transcription factors. Activated STAT5 proteins are detected in reduced levels in lymphocytes recovered from HIV-infected patients and immunocompromised mice. Both of these types of receptor signaling pathways have recently been shown to interact with serine/threonine kinases such as MAP kinases. A common intermediate pathway initiating from receptors to the nucleus is the Ras/Raf/MEK/ERK (MAPK) cascade, which can result in the phosphorylation and activation of additional downstream kinases and transcription factors such as p90Rsk, CREB, Elk, and Egr-1 [55, 56]. Therefore, it is intriguing that Tat expressing cells show down-regulation of MAPK components (Table 3, Figure 3B and 3C), essential mediators between receptors and nuclear transcription factors. This would imply that latently infected cells that express Tat (doubly spliced RNA) and not the whole virus (all three classes of the RNA), can control signal transduction related to membrane and transcriptional signaling (Figure 6). Interestingly, Tat, through the RGD motif, which controls integrin-based cell signaling, has been reported to mediate the activity of phosphotyrosine phosphatase(s). This in turn which would lead to a decrease in the levels of phosphotyrosine-containing proteins such as ERK-2/p42MAPK kinases . Cysteine-rich and basic Tat peptides have been shown to inhibit VEGF-induced ERK activation and mitogenesis. These peptides also inhibited proliferation, angiogenesis, and ERK activation induced by basic fibroblast growth factor with similar potency and efficacy . Consistent with this model, it has been shown that treatment of neural cells with culture supernatants from HAART-treated subjects, which presumably contain extracellular Tat, resulted in down-regulation of the JNK, AKT, and ERK kinases . Finally, activation of MAPKs has been shown to activate the singly spliced and unspliced (genomic) latent HIV-1 virus. For instance, the signal transduction pathways that regulate the switch from latent to productive infection have been linked to MAPK. The induction of latent HIV-1 expression has been shown to be inhibited by PD98059 and U0126, specific inhibitors of MAPK activation. The MAPK acts by stimulating AP-1 and a subsequent physical and functional interaction of AP-1 with NF-κB, resulting in a complex that synergistically transactivates the HIV-1 . At the level of infection and entry, the activation of MAPK through the Ras/Raf/MEK (MAPK kinase) signaling pathway enhances the infectivity of HIV-1 virions. Virus infectivity can be enhanced by treatment of cells with MAPK stimulators, such as serum and phorbol myristate acetate, as well as by coexpression of constitutively activated Ras, Raf, or MEK in the absence of extracellular stimulation . Also, following infection, efficient disengagement of the reverse transcription complex from the cell membrane and subsequent nuclear translocation, requires phosphorylation of the reverse transcription complex components by ERK/MAPK; demonstrating a critical regulation of an early step in HIV-1 infection by the host cell MAPK signal transduction pathway . Therefore, Tat down-regulation of the MAPK pathway in latent cells implies that much of the host signal transductions connected to activation are down-regulated, and at the same time, these cells may be refractory to subsequent infection by other viruses. Prothymosin α (ProTα) belongs to the α-Thymosin family which comprises different polypeptides widely distributed within animal tissues. Although its role has remained controversial, it is involved in the increase of immediate early genes such as c-myc , which is upstream of cyclin D synthesis and necessary for cell division . In humans, ProTα is coded by a gene family of six members. One of them contains introns, exons and classic regulatory signals, while the remaining five are intronless genes  located on chromosome 2 . There are two mRNA transcripts, which arise in a ratio of 9:1 (shorter/longer form), where only the long transcript is regulated by extracellular signals. It has been demonstrated that malignant tissues with accelerated cell cycle show higher levels of ProTα expression than normal or surrounding healthy tissues . ProTα was shown as a marker for breast cancer , hepatocarcinoma , and plasma levels of its derivative Tα1 been proposed as a marker for the prognosis of lung cancer . In ligand blotting assays, ProTα bound only to chromatin pools and nuclear fractions where histone H1 was present [71, 72]. The analysis of the interaction of ProTα with H1-containing chromatin suggests a putative role for ProTα in the fine-tuning of the stoichiometry and/or mode of interaction of H1 with chromatin . Interestingly, HL-60 cells overexpressing ProTα show an enhancement of accessibility of micrococcal nuclease to chromatin, implying relaxed chromatin structure for enhanced cell cycle gene expression . A broad study using several mononuclear and fibroblastic cell lines has shown that ProTα mRNA accumulation is cell cycle phase-dependent. In the U937 monocytic cell line, ProTα mRNA peaked at the end of S/G2 phase and fell towards the entry into the new G1 phase. More prominent mRNA regulation was found in the fibroblastic cell lines CV1 and NIH3T3, with peak mRNA levels at the end of S-phase. In all cases the expression pattern coincided with that of cyclin B and Cdc2/cyclin B activation . It is interesting to note that Cdc2 (Acc# X05360), Cdc10 homolog (Acc# S72008), and Cdc37 (Acc# U43077) were all up-regulated in Tat expressing cells. Cdc2, a catalytic subunit of cyclin-dependent kinases, is required for both the G1-to-S and G2-to-M transitions. In the fission yeast Schizosaccharomyces pombe, the execution of Start requires the activity of the Cdc2 protein kinase and the Cdc10/Sct1 transcription complex. The loss of any of these genes leads to G1 arrest . Cdc37 encodes a 50-kDa protein that targets intrinsically unstable oncoprotein kinases including Cdk4, Raf-1, and v-src to the molecular chaperone Hsp90, an interaction that is thought to be important for the establishment of signaling pathways. Cdc37 expression may not only be required to support proliferation in cells that are developmentally programmed to proliferate, but may also be required in cells that are inappropriately induced to initiate proliferation by oncogenes. For instance, MMTV-Cdc37 transgenic mice develop mammary gland tumors at a rate comparable to that observed previously in MMTV-cyclin D1 mice, indicating that Cdc37 can function as an oncogene in mice and suggests that the establishment of protein kinase pathways mediated by Cdc37-Hsp90 can be a rate-limiting event in transformation . Also, analysis of proteins that co-immunoprecipitated with Cdk6 and Cdk4 has shown complexes containing both Hsp90 and Cdc37 [77–79]. Cdc37 also promotes the production of Cak1. Cak1 in yeast is the human homolog of CAK trimeric enzyme containing CDK7, cyclin H, and MAT1. Both human and yeast Caks function as RNA polymerase II CTD kinase, Cdk activating kinase, and DNA damage/repair enzymes. Cdc37, like its higher eukaryotic homologs, promotes the physical integrity of multiple protein kinases, perhaps by virtue of a cotranslational role in protein folding . Finally, Hsp90/Cdc37 has recently been shown in the stabilization/folding of Cdk9 as well as the assembly of an active Cdk9/cyclin T1 complex responsible for P-TEFb-mediated Tat transactivation . A highly ordered chromatin structure presents a physical obstacle for gene transcription; presumably by limiting the access of transcription factors and RNA polymerase II core machinery to target DNA [82, 83]. In concert with the observation that corepressors are associated with HDAC activities [84, 85], it appears that the transcriptional outcome of nuclear receptors is determined by the balance of histone acetylation and deacetylation activities, and that ligands serve as a switch to recruit HATs with the concomitant dismissal of HDACs. Signal transduction pathways add another layer of regulation to the functions of CBP/p300. In the case of the POU homeodomain factor Pit-1, transcriptional activity is potentiated by MAPK pathways . Therefore, down-regulation of MAPK pathway members in Tat expressing cells, as seen in Table 3, is consistent with decreased phosphorylation of DNA binding factors such as Pit-1, and overall lower DNA binding activity. Here, we describe the effect of coactivator proteins SRC-1 (Acc# AJ000882, U90661, Table 1) and p300 (Acc# U01877, Table 3), and their relation to differentiation genes such as retinoic acid receptor (RAR/PML, Acc#: X06614, Table 1), and Leptin receptor variant (Acc#: U66496, Table 1); all of which are down-regulated in Tat expressing cells (Figure 5). Synthesis of IL-8 in Tat expressing cells. Hela cells (pCEP4, and eTat) were either unblocked (unt), or blocked with hydroxyurea (Hu) (2 mM) for 14 h, released, washed twice with phosphate-buffered saline (PBS) and subsequent addition of complete medium . Supernatants were collected at 9 hrs after release for ELISA. All remaining suspension cells were treated with 1% serum for 48 hrs prior to addition of Hu. PHA-activated PBMCs were kept in culture for 2 days prior to addition of Tat protein. 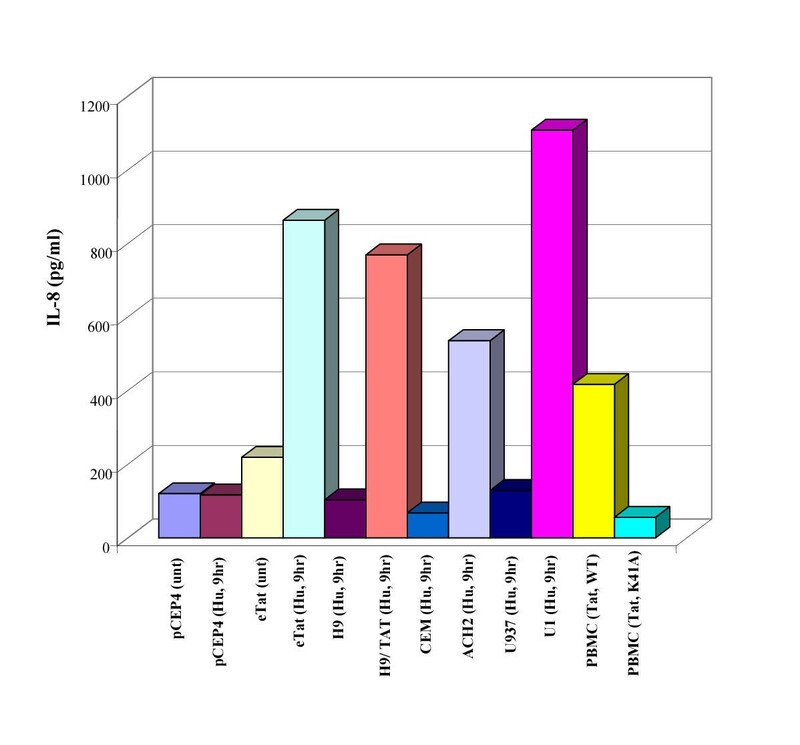 Approximately 5 × 106 PBMCs were used for treatment with either wild type or K41A Tat mutant (100 ng/ml) proteins. After an initial incubation for one hr with Tat proteins, cells were washed and cultured in complete media for 24 hrs, prior to IL-8 ELISA. Predictive model for control of gene expression and signal transduction by constitutive Tat expressing cells. Down-regulation of SWI/SNF components such as BAF 170 and 60 along with coactivators CBP/p300 and SRC-1 may down-regulate a subset of cellular genes that depend on chromatin remodeling and/or co-activator function for their gene expression. Such genes depend on the presence of ligand receptors that require either both SRC-1 and p300 or individual co-activator for their activity. Over the past three decades a great deal of evidence has accumulated in favor of the hypothesis that steroid receptor hormones act via regulation of gene expression. The action is mediated by specific nuclear receptor proteins, which belong to a superfamily of ligand-modulated transcription factors that regulate homeostasis, reproduction, development, and differentiation . This family includes receptors for steroid hormones, thyroid hormones, hormonal forms of vitamin A and D, peroxisomal activators, and ecdysone . Nuclear hormone receptors are ligand-dependent transcription factors that regulate genes critical to such biological processes as development, reproduction, and homeostasis. Interestingly, these receptors can function as molecular switches, alternating between states of transcriptional repression and activation, depending on the absence or presence of a cognate hormone, respectively. In the absence of cognate hormone, several nuclear receptors actively repress transcription of target genes via interactions with the nuclear receptor corepressors SMRT and NCoR. Upon binding of the hormone, these corepressors dissociate from the DNA-bound receptor, which subsequently recruits a nuclear receptor coactivator (NCoA) complex. Prominent among these coactivators is the SRC (steroid receptor coactivator) family, which consists of SRC-1, TIF2/GRIP1, and RAC3/ACTR/pCIP/AIB-1. These cofactors interact with nuclear receptors in a ligand-dependent manner and enhance transcriptional activation via histone acetylation/methylation and recruitment of additional cofactors such as CBP/p300 . CBP/p300 has been implicated in the functions of a large number of regulated transcription factors based primarily on physical interaction and the ability to potentiate transcription when overexpressed . In the case of nuclear receptors, the interaction with CBP/p300 is ligand-dependent and relies on the conserved nuclear receptor functional domain, AF-2 (activation function 2). In vivo studies have supported the conclusion that CBP/p300 are components of the hormonal-regulation of transcription in fibroblasts isolated from a p300-/- mouse; and loss of the p300 gene severely affects retinoic acid (RA)-dependent transcription . In a separate study using hammerhead ribozymes that specifically cleave CBP or p300 mRNA, Kawasaki et al  reported that reduced cellular CBP or p300 levels resulted in compromised expression of endogenous RA-inducible genes such as p21/Waf1 and p27 cdk inhibitors. Along this line, Tat expressing cells have lower levels of p21/Waf1 presumably due to inactivation of p53 and a lack of p300/RA- induced gene expression. Consistent with this interpretation, CBP and p300 harbor transcriptional activation of ligand-induced RA or ER function on a chromatinized template . The NcoA family members constitute SRC-1/NcoA-1 , TIF2/GRIP1/NcoA-2, [94, 95] and pCIP/ACTR/AIB1 [96–98] proteins, which interact with liganded RA receptor (RAR), and CBP/p300. Overexpression of these NCoA factors enhances ligand-induced transactivation of several nuclear receptors . A weak intrinsic HAT activity has been reported in SRC-1/NCoA-1 and pCIP/ACTR/AIB1, suggesting that chromatin remodeling may also be a function of these NCoA factors [99, 100]; although they do not appear to contain regions homologous to the HAT domains of CBP/p300 or p/CAF. Structure-function analysis of the NCoAs have revealed multiple copies of a signature motif, LXXLL, with conserved spacing that is required for interaction with nuclear receptors and CBP/p300 [99, 101]. Intriguingly, different LXXLL motifs are required for PPARγ (Peroxisome Proliferator activated receptor γ, a gene down-regulated in Tat expressing cells; Acc# L07592, Table 1) function in response to different classes of ligands, suggesting distinct configuration of assembled complexes. Taken together, through the use of microarray technology, we have described one of the first observations about how Tat is able to control various host cellular machineries. Although our data is consistent with most of the cited literature on the effects of Tat in infected host and uninfected bystander cells, we caution that the transcriptional profiling in chronically infected cells such as ACH2 or H9/Tat cells may not necessarily be representative of the pattern of expression observed in most cells infected by other group M, N, or O HIV-1 isolates. We recently extended our observations by utilizing other HIV-1 infected cells which normally express Tat (U1), and addition of exogenous purified Tat to uninfected PBMCs. 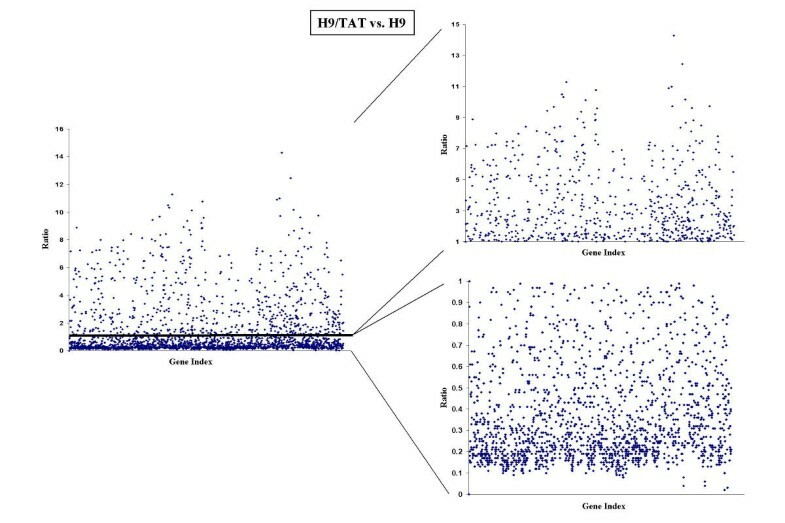 Preliminary results using western blots supports the idea that genes which were altered in H9/Tat system also showed a similar level of change in few of the tested genes (Figure 3C). This notion of consistency was further confirmed using the IL-8 activation by Tat. Interleukin-8 (IL-8) belongs to the CXC chemokine family and is secreted by several different cell types, including monocytes, neutrophils, endothelial cells, fibroblasts, and T lymphocytes. IL-8 production (induced by several stimuli, including IL-1, TNF-, and phorbol myristate acetate) is primarily regulated at the transcriptional level. IL-8 is a potent chemotactic factor for granulocytes and T lymphocytes, and is found in HIV-infected individuals. The CXC chemokine IL-8 does not bind to CCR5. It has previously been shown that IL-8 mRNA induction was seen less then 1 h after Tat (72aa) stimulation, and levels remained elevated for up to 24 h, leading to IL-8 protein production . Along these lines, we have previously shown that the IL-8 gene is expressed in a cell cycle-dependent manner in cells that express the Tat protein, and the induction is during the S phase of the cell cycle and regulated by stable NF-kB binding to the IL-8 promoter . When looking for IL-8 at the G1/S border, we found that all Tat containing cells, including PBMCs that were treated with exogenous Tat showed an up-regulation of IL-8 in the supernatant (Figure 4), further implying that results obtained from the H9/Tat system may infact be of general physiological relevance in vivo. Proposed model for changes in signal transduction. A) Down-regulation of receptor tyrosine kinases (RTK) by Tat which modulates the phosphorylation and transcription of downstream effectors such as Ras, Raf, MEK, MAPK, and control transcription factor phosphorylation. B) Role of Tat in the increase of genes necessary for proliferation, such as Cdc2, Cdc37, and Prothymosin α, and down-regulation of differentiation genes, such as receptors, co-receptors, and signal transduction genes. Finally, throughout the current study we came across some technical findings that were critical in the confirmation of most of our results. For instance, few genes did not correlate in their activation or suppression levels when comparing fold changes between microarrays and protein levels using western blot analysis. We suspect this is because many genes that are transcribed may not necessarily be translated, due to their cell cycle stage, 5' stem and loop RNA structures, varying half-lives of proteins and mRNAs, and a host of other unknown variables. Also, specific changes that occur in a cell may not be required in redundant pathways that score for a specific function. This is commonly seen in the differences between HIV-1 infected or Tat expressing in vitro cell lines and AIDS patients PBMC samples. Therefore, other microarrays would have to be performed on purified infected PBMCs to confirm most of the changes observed in Tables 1, 2, and 3. Unfortunately, to date this particular issue is not feasibly addressable, since it is not possible to isolate a homogenous population of infected T- or Monocytic cells from AIDS patients. Also, confirmatory tests for protein expression would have to be done with both hydrophilic and hydrophobic extraction buffers. For instance, we have observed that PCNA protein, which is up-regulated in Tat expressing cells, extract best with hydrophobic buffers from the nucleus, presumably due to its binding to DNA replication machinery (data not shown). Future experiments will address issues related to differences between various HIV-1 Tat clades, host expression levels between T- and Monocytic cells, and its effect at various stages of the cell cycle. Expression profiling from HIV-1 or Tat expressing cells holds great promise for rapid functional analysis. Here, we have described the effect of Tat and its alterations with the host cellular gene expression. We observed that more than 2/3 of the cellular genes tested were down-regulated by Tat. These genes belong to receptor, co-receptor, and co-activator pathways that are part of serine/threonine receptor tyrosine kinase, Ras/Raf/MEK/ERK (MAPK) cascade, which control proliferative and/or differentiation signals. We also observed a great deal of increase in the host cell translation apparatus with the possible aim of optimizing viral mRNA translation prior to viral maturation and release. Therefore, HIV-1 accessory doubly spliced messages such as Tat, may control the host gene expression in latently infected cells, and determine not only viral transcription, but also the fate of post-transcriptional events. ACH2 cells are HIV-1 infected CD4 lymphocytic cells, with an integrated wild-type single-copy chromatinized DNA. The CEM T cell (12D7) is the parental cell for ACH2 cells. ACH2 cell lines has a single copy of LAI strain proviral sequence. The TAR has a point mutation at (C37 -> T), which no longer responds (efficiently) to Tat. However, the cell line is fully capable of making infectious virus in presence of TNF, PHA, PMA, and a host of other stimuli. H9 and H9/Tat cells are both CD4+ Lymphocytic cells, where H9 cells carry a control integrated vector without the Tat open reading frame, and H9/Tat cells carry integrated Tat expression vector. Both cell lines were a generous gift of George Pavlakis (NCI, NIH). U1 is a monocytic clone harboring two copies of the viral genome from parental U973 cells. All cells were cultured at 37°C up to 105 cells per ml in RPMI-1640 media, containing 10% Fetal Bovine Serum (FBS) treated with a mixture of 1% streptomycin and penicillin antibiotics, and 1% L-glutamine (Gibco/BRL). Phytohemagglutinin-activated PBMC were kept in culture for 2 days prior to addition of Tat protein. Isolation and treatment of PBMC were performed by following the guidelines of the Centers for Disease Control. Approximately 5 × 106 PBMC were used for treatment of wild type and K41A Tat mutant (100 ng/ml) proteins. After an initial incubation for one hr with Tat proteins, cells were washed and cultured in complete media for 24 hrs, prior to western blots. pCEP4, eTat cells were HeLa cells stably transfected with either a backbone control plasmid (pCEP4; Invitrogen) or a plasmid expressing Tat (1–86) with a C-terminal epitope tag (eTat) . HeLa cell lines containing either the control or eTat plasmid were selected by single-cell dilution. Both cell types were selected and maintained under 200 μg of hygromycin per ml. Verification of Tat transcriptional activity was achieved by electroporation of reporter plasmids as previously described . Hela cells were blocked with hydroxyurea (Hu) (2 mM) for 14 h. Following the block, cells were released by being washed twice with phosphate-buffered saline (PBS) and by the addition of complete medium. All suspension cells were treated with 1% serum for 48 hrs prior to addition of Hu. Supernatants were collected and analyzed by an IL-8 ELISA according to the manufacturer's instructions (Biosource International). For controls, each sample, approximately 1 × 106 cells was processed for cell sorting. Cells were washed with PBS and fixed by addition of 500 μl of 70% ethanol. For fluorescence-activated cell sorting (FACS) analysis, cells were stained with a cocktail of propidium iodide (PI) buffer (PBS with Ca2+ and Mg2+, RNase A [10 μg/ml], NP-40 [0.1%], and PI [50 μg/ml]) followed by cell-sorting analysis. FACS data acquired were analyzed by ModFit LT software (Verity Software House, Inc.). All cells were cultured to mid-log phase of growth, washed with PBS without Ca2+ and Mg2+, and lysed in a buffer containing 50 mM Tris-HCl (pH 7.5), 120 mM NaCl, 5 mM EDTA, 50 mM NaF, 0.2 mM Na3VO4, 1 mM DTT, 0.5% NP-40 and protease inhibitors (Protease inhibitor cocktail tablets, Boehringer Mannheim, one tablet per 50 ml). The lysate was incubated on ice for 15 min, and microcentrifuged at 4°C for 10 min. Total cellular protein was separated on 4–20% Tris-glycine gels (Novex, Inc.) and transferred to a polvinylidene difluoride (PVDF) membranes (Immobilon-P transfer membranes; Millipore Corp.) overnight at 0.08 A. Following the transfer, blots were blocked with 5% non-fat dry milk in 50 ml of TNE 50 (100 mM Tris-Cl [pH 8.0], 50 mM NaCl, 1 mM EDTA) plus 0.1% NP-40. Membranes were probed with a 1:200–1:1000 dilution of antibodies at 4°C overnight, followed by three washes with TNE 50 plus 0.1% NP-40. All antibodies used in this study were purchased from Santa Cruz Biotechnology. The next day, blots were incubated with 10 ml of 125I-protein G (Amersham, 50 μl/10 ml solution) in TNE 50 plus 0.1% NP-40 for 2 hrs at 4°C. Finally, blots were washed twice in TNE 50 plus 0.1% NP-40 and placed on a PhosphorImager cassette for further analysis. Cells were grown to mid-log phase of growth (5.0 × 106), pelleted, and washed twice with cold D-PBS without Ca2+/Mg2+. Total RNA was extracted on ice using Trizol Reagent (Life Technologies, Inc.). Purified RNA was then analyzed on a 1% agarose gel for quality and quantity prior to each experiment. Gene expression analysis was performed using Micromax™: Human cDNA Microarray System I (cat# MPS101, NEN Life Science Products). On a glass microarray slide, 2400 know human genes were arrayed into 4 separate grids (A, B, C, D), containing 600 genes each (gene description and location on microarrays available at NEN website: http://www.nenlifesci.com). All human genes were ~2200 bp cDNAs, and were characterized from 50+ human cDNA libraries (AlphaGene, Inc., Woburn, MA). In addition to the human genes, three plant control genes were spotted on each grid and were utilized to balance the Cyanine-3 (Cy-3) and Cyanine-5 (Cy-5) fluorescence signals. A total of 8 μg each of H9 (control sample) and H9/Tat (test sample) mRNAs were reverse transcribed into Biotin and Dinitrophenyl (DNP) labeled cDNA, respectively. After cDNA quality and quantities were analyzed, both cDNAs were then pooled and simultaneously hybridized overnight at 65°C onto the glass microarray. The next day, the microarray slide was serially washed in 0.5× SSC (Sodium Citrate-Sodium Chloride) + 0.01% SDS (Sodium Dodecyl Sulfate), 0.06× SSC + 0.01% SDS, and 0.06× SSC. Next, the Tyramide Signal Amplification (TSA™) was then used to amplify the Cy-3 and Cy-5 signals using antibody-enzyme conjugates, α-DNP-Horseradish peroxidase (HRP) and α-Streptavidin-HRP with Tyramide linked Cy-3 and Cy-5. Screening and data analysis was performed by NEN. Gene expression of CEM and ACH2 were performed using Atlas Human cDNA Expression Array (Clontech Laboratories Inc., Palo Alto, CA) according to the manufacturer's directions. One μg of poly A+ RNA each was DNase I treated, purified using a CHROMA SPIN-200 column, and reverse transcribed into 32P-labeled cDNA. The CHROMA SPIN-200 column was used to purify the 32P-labeled cDNA from unincorporated 32P-labeled dNTPs and small (<0.1 kb) cDNA fragments. Each sample was then hybridized to a human cDNA expression array overnight with continuous agitation at 68°C. The next day, the array was washed three times with gentle agitation, first wash with 2× SSC + 1% SDS and the last two washes with 0.1× SSC + 0.5% SDS at 37°C. Array was exposed to a PhosphorImager Cassette and analyzed using ImageQuant software. Total cellular RNA was extracted using the RNAzol reagent (Gibco/BRL). Total RNA (20 μg) was isolated from various cells and ran on a 1% formaldehyde-agarose gel overnight at 75 V, transferred onto a 0.2 μm nitrocellulose membrane (Millipore Inc.), UV cross-linked, and hybridized overnight at 42°C with 32P-end-labeled 40 mer oligo probes including p21/Waf1, C-myc, Pro-thymosin, Actin, Tat, and Ubiquitin (Loftstrand, Gaithersburg, Md.). Next day, membranes were washed two times for 15 min each, with 10 ml of 0.2% SDS-2XSSC at 37°C, exposed, and counted on PhosphorImager Cassette. Both H9 and H9/Tat cells were infected in the presence of 10 ug of polybrene. For PBMC infections, PHA activated PBMCs were kept in culture for 2 days prior to each infection. Isolation and treatment of PBMCs were performed by following guidelines from the CDC (Isolation, culture, and identification of HIV, Procedural Guide, July 1991, Atlanta, GA). Approximately 2 × 10 6 of H9 or H9/Tat cells, and 5 × 10 6 PBMC cells were infected with either an HXB-2 (CXCR4, T-tropic), or BaL (CCR5, Macrophage-tropic) at 5 ng of p24 gag antigen/ HIV-1 strain. Both viral isolates were obtained from the NIH AIDS research and reference reagent program. After 8 hrs of infection, cells were washed and fresh media was added. Samples were collected every 3rd day and stored at -20 C for p24 gag ELISA. Media from HIV-1 infected cells were centrifuged to pellet the cells and supernatants were collected, and diluted to 1:100 to 1:1000 in RPMI 1640 prior to ELISA. The p24 gag antigen level was analyzed by HIVAG™-1 Monoclonal antibody Kit (Abbott Laboratories, Diagnostics Division). The authors would like to thank George Pavlakis for H9 and H9/Tat cells. This work was supported by grants from the George Washington University S funds, NIH grants AI44357, AI43894 and 13969 to F.K., and in part by a support from Alexandrine and Alexander Sinsheimer Foundation to CF, KW, and LD. CF, and FS carried out the ACH2 and H9/Tat microarrays. LD, CE, IZ, CGL, and KW aided in westerns, northerns, p24 and ELISA assays. AM, KK, SB, AP, and FK aided in data interpretation, Bioinformatics, literature searches and writing the manuscript.